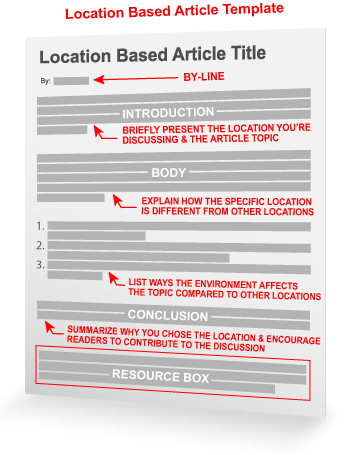 This article template is all about location, location, location. Each of us has knowledge and experiences to share from the places we’ve grown up in, lived in and travelled to, but we may not really think of the locations as sources of article inspiration. In fact, sharing location-specific details about places you are familiar with is a great way to write relevant content and build your credibility as an Expert Author. This article template is a guide for embracing the local expert in you. Pick a Topic and Location – Meaningful location-based articles give readers a perspective on how one location’s environment is different from another. One way to ensure your content is meaningful is to narrow your topic down and don’t be afraid to get specific with details. Add a One-Paragraph Introduction – Provide a general outline of the topic and location being discussed. Explain How The Location Is Special – Think about how the location’s characteristics make it stand out compared to other locations. If you’re giving a travel recommendation, for example, you could discuss how things like the weather, the people and specific places make the travel destination unique. Compare the Environment With Other Locations – This may be best displayed in a list. List exactly how your niche environment is different from other places. For more information on how to enrich your article with local content, check out this previous Blog post: Spicing Up Articles With Local Flavor. Back Up Details – Personal insights can make your location-specific articles more meaningful for readers. Be honest with them. If you’ve experienced something personally, your feedback can really help. Summarize and Conclude – Recap the main points that you shared and why they are important. Don’t include the location in the title and omit it from the article body. Be sure your article body content delivers on the promise made in the title and your reader is getting what they came looking for. Delivering on the promise of the location in the title means that your article should substantially deliver the relevance of that location. Ask yourself why the location is relevant, why it matters, and what benefit will it serve your reader. ACID TEST: If your location can be replaced with another location and it still reads right, you missed something on the delivery. If you’re looking for more article templates like this one, you can check out our archive of article templates. Use this template today to write your next set of high-quality, original articles for more traffic back to your website or blog. Then come back here and leave a comment to let us know how it worked for you. Great advice to target by location! I hadn’t known about the article templates, thank you!! As I am new to this I found this advice extremely helpful, thanks. is location so important for us? Great idea! Living and doing business here in the coalfields of the Appalachian Mountains makes for some unique challenges, both geographic and socioeconomic. THank’s! I have many idea for that! This article is educating, I have learn something that will guide me when writing articles. I can also be used for e-mail and other writings as well. I was looking for that, how to improve my article writing. As co-owner of a wedding event venue in a part of Birmingham that was affected by the civil rights movement during the 1970’s and has the stigmata attached to that dark part of American history, I can understand the need to have positive press out in the WWW to allow people to transition their stereotypical view of Birmingham. This template will assist me in producing such content! THANKS! Thanks, I am using this for an article I am writing right now! Templates really do make it a lot easier to create an article that delivers value to the reader and exposure to the writer. Hope to see more of them. I have had many problems with this issue in getting the articles approved. Many times when writing articles about “apartments in Houston”, or about “Houston apartment locators”, my articles are rejected. The acid test makes sense, but when going after a certain keyword, it seems impossible to get the article approved. Could you please help me figure out how to get these approved. The apartment locator business is the same where ever you go – it will not pass the acid test. Location articles are, I think, one of the most difficult as they depend highly on how YOU viewed the location. And each of us has an emotional attachment to special locations that is hard to share in language that is not mushy! My main problem is that I cannot make them pass the acid test about the Houston apartment locators – since almost every situation the city’s name can changed for Atlanta, Sand Diego, etc.. This is very helpful and valuable advice. Thanks for sharing this with us. I have been doing a few articles related to location as I love to travel and have had the privilege of being able to travel a lot, whether for business or pleasure. Obviously, a number of my writing will focus on travel as I will tap into my experience for content and you have provided me with an effective system by which I could improve my written work. I’ll be checking out your other articles for more helpful advice. More power to you! You rock \m/… I’ve been writing articles for quite sometime now, and they always end up having a crisscross of ideas flowing on uneven grounds.